My daughter's friend is getting married soon & they just had a bridal shower for her. She didn't really want cake, so I suggested some individual parfaits and panna cotta. 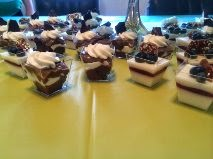 The bride to be was thrilled with her individual desserts and everyone loved them. I chose to make chocolate brownie parfaits. I used brownies, chocolate pudding, a special whipped cream, and homemade toffee pieces. I layered them into individual serving cups. The panna cotta was white chocolate with a raspberry gelee. On the top I place a Florentine with a couple of blueberries.